*We received some products from Costco, items we regularly use. Of course, all opinions are 100% our own. You can read our full disclosure policy here. We all love trying some samples at Costco, provided a random person didn’t just park their cart sideways and grab the last one, right? Oh, no they didn’t! 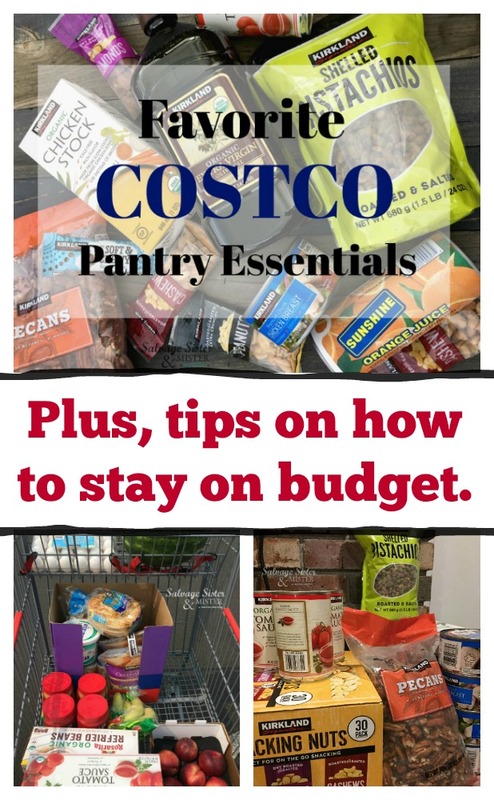 It’s fun to try all the new things, but if you are looking for pantry staples, here is a list of our everyday pantry items. You know, the things always on your list. 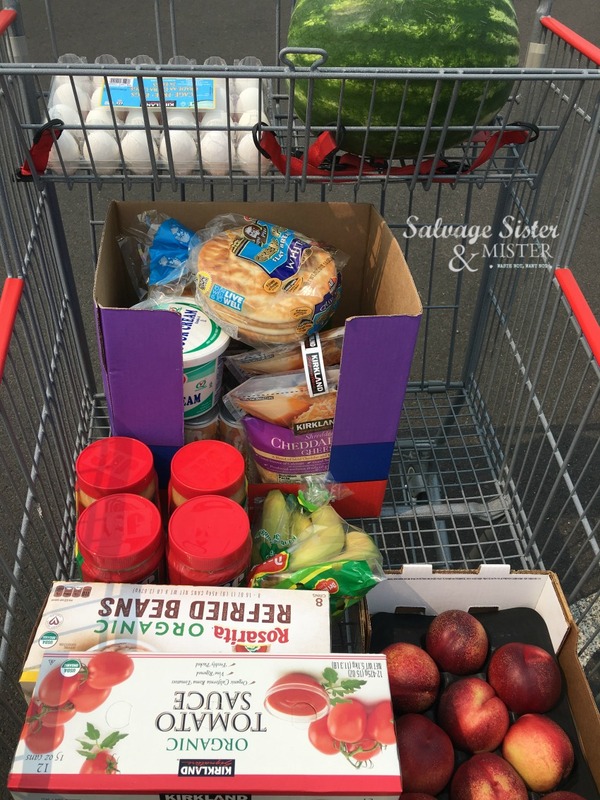 Plus, some tips for shopping smart! TIP– By sticking to a list, you are more apt to save time and money, waste less, and get what you really need instead of what looks shiny. Kirkland Chicken Stock – Now, you all know I make my own, but sometimes you need more or don’t have time to defrost it as it’s in a solid state. This really can make soup/sauces in a hurry! 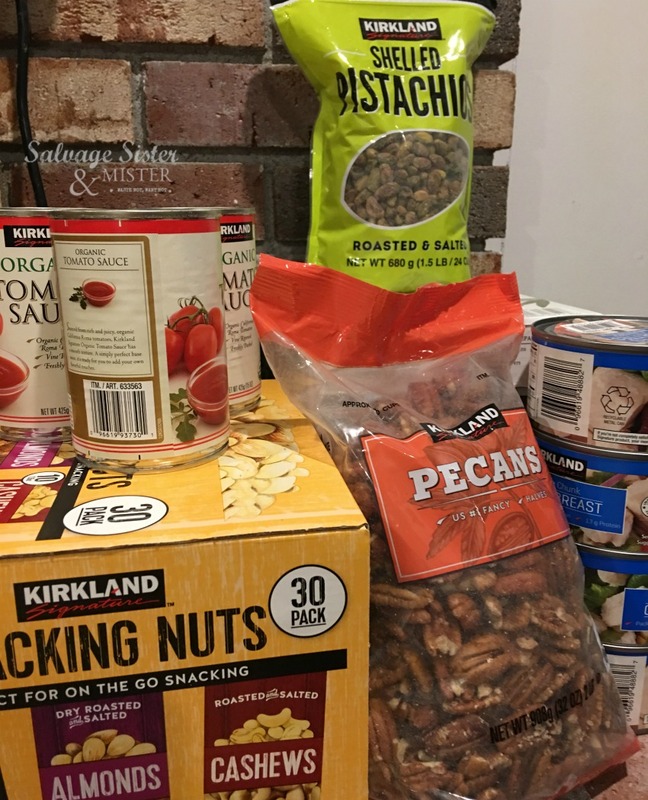 Kirkland Nuts – We like to grab some snacks and go out hiking or take a drive. We always grab cheese, fruit, and nuts. The Kirkland ones are super delish and the single serve packs are great for grab and go. TIP – Can’t use them all? Freeze them. They can last 6 mos – 2 years depending on the nut. Kirkland Organic Tomato Sauce – I really do love to cook, but there are a lot of meals to cook and I need items that can make dinner in a hurry….that taste great. Need a quick chili? Grab some tomato sauce and this recipe and you’ll have dinner in no time. Kirkland Premium Chunk Chicken Breast – Are you sensing a theme? I need quick meals! And if you are looking for a quick and TASTY meal, check out this one from the Six Sisters gals…YUMMMO!!!! Great to have on hand when you don’t have any fresh or frozen meat. Kirkland Olive Oil – This is our main oil, so even though we don’t have a lot of people here, it gets used up with no problem… and is a nice quality olive oil! Kirkland Soft & Chewy Granola Bars – The guys love grabbing these on the go. The Mister has these regularly for a work snack. Kirkland Tortilla Chips – They are around $3.50 a bag here, and it’s huge! Kirkland Maple Syrup – Just don’t forget to refrigerate it after opening! There’s a family story here, but seriously don’t forget! *These will vary by region. Famous Dave’s Cornbread – Just yummmm! Ghiradelli Brownie Mix – You can read more about that here. Super easy to make and great for last minute parties or cravings. Sunshine Frozen Orange Juice – I’m actually quite picky when it comes to OJ and like this very much. It’s the only one I get now. Mission Tortillas – We go through a lot of tortillas so a large pack works for us. Again, some can go in the freezer if you want. I store mine in the refrigerator and they last quite a while. Quaker Simply Granola – Our youngest absolutely loves this cereal. It’s also what I use when I make these Granola Roll-Up’s. Mrs. Thinsters Cookie Thins, Coconut – There is something about these that takes me straight back to childhood. Olive Garden Salad Dressing – I don’t usually care for bottled dressing. I much rather make my own, but this is a family favorite when I am needing something quick or out of ingredients to make my own. Bakery Ciabatta Rolls– I place them in freezer bags and they are easy to pull out and defrost for a quick breakfast sandwich. We love these rolls for all kinds of sandwiches. Fruit – The bananas are a great price, and I look for seasonal produce. Note- I am a fruitaholic so it’s easy to go through in our house. Milk – Funny that some containers have a “smashed face” and other regions have the standard shape. What does your area have? Eggs – Because out of three chicken that we got, only one lays eggs!!!!! Sour Cream – Tip: To keep sour cream fresh longer, smooth out the top before placing it back in the fridge. Shredded Cheddar and Colby Jack – This a great blend for most anything I whip together. Rotisserie Chicken – It’s usually the best price and best tasting around! If you cook regularly, spices here are good. If you don’t use a spice often, it may “expire” before you can use all of it. Most spices have a year or less use by date. That means they are the tastiest when fresh. I use my phone notes to keep an ongoing shopping list. All the essentials are added on there, and I check what I need as I go. This really does make getting in and out fairly simple. And, if you like to beat the crowds, I got right before it opens or before it closes. It makes it quick and simple. 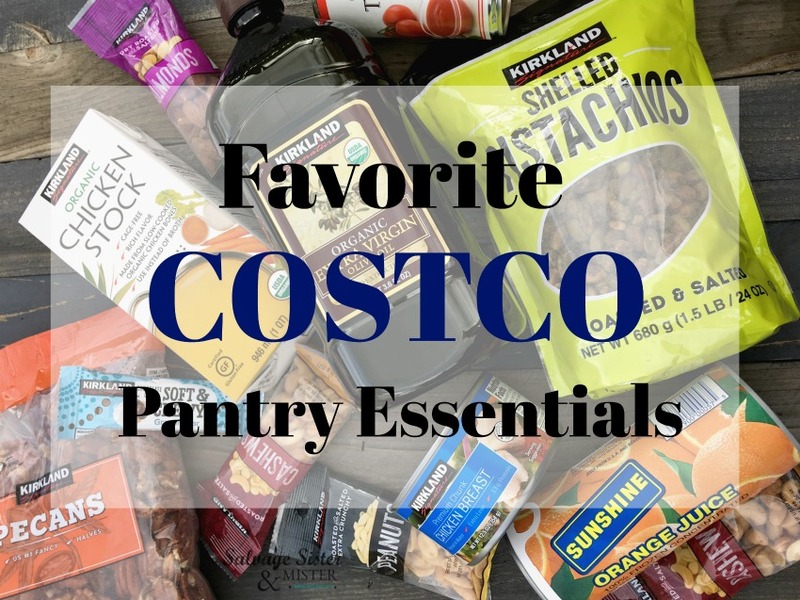 Now, these are our FAVORITE COSTCO PANTRY ESSENTIALS; we would LOVE to know yours. Maybe there is an item(s) that we HAVE to try. Spill the beans and let us know what it is.